I love the series Cupcakes Wars on the Food Network. To watch the emotions and ingredients fly all over the kitchen is pure entertainment to me. I especially love that it doesn't matter what cupcakes are the contestants specialty, there no cupcake discrimination and all are welcome. When the episode aired with Hollis Wilder and her Gluten-Free Chocolate-Cardamom Cupcake, I was all over these, especially since my husband was diagnosed with a gluten intolerance a few weeks ago. I am not a fan of gluten-free baked goods, but I've gotta tell you, these are AMAZING. Like amazing. My mother-in-law, who is also suffers from a gluten allergy, and I ate 2 each as soon as they came out of the oven. We pretty much moaned through them in between huffing the heat away. Gluten-free or not, these are a must try. You will moan through them too. *This recipe is meant for the cupcakes to be mini, however, I'm a go big or go home kind of gal in the kitchen, so I modified the recipe to a smaller scale and got about 18 regular sized cupcakes. I also found the directions confusing, so I hooked you up. God love the novice baker....it could have been a disaster. 3 eggs, separated - SAVE THE YOLKS! You will need them. 1 cup superfine sugar, divided (If you don't have superfine sugar, whiz granulated sugar in a food processor for 30-45 seconds). Place the chocolate in a large heatproof bowl. Bring the cream and cardamom just to a simmer over medium-high heat; pour the mixture over the chocolate. Let stand, without stirring, until cool. Once cooled, stir until incorporated. Do not over stir. Preheat oven to 325º F. Line cupcake pans with liners. Melt the chocolate IN the boiling water and set aside. In a small mixing bowl, beat the egg whites until frothy and stiff but not dry. Add ¼ cup sugar and beat until just incorporated; set aside. In another bowl, cream the butter with remaining ¾ cups sugar and vanilla on medium speed until fluffy. Add the egg yolks and beat well. Blend in the melted chocolate. In a bowl, sift together the rice flour, cornstarch, baking powder, baking soda, and salt. Alternate adding the flour mixture and the buttermilk to the chocolate mixture, beating after each addition until smooth. Fold in the Chocolate-Cardamom Ganache. Fold in the beaten whites. Fill the cupcake liners halfway and bake for 23-25 minutes. I work with children for a living. Although I LOVE my job and the fact that all my co-workers are under the age of 5, meal times can be pretty stressful. I have come across more children that are picky eaters than not since working in my field. Where I come from, if you are not a foodie, there is something wrong with you. This goes for kids and adults alike. Since kids need variety, just as adults do, I've had to become creative in the kitchen. I make a point to hide oodles of goodness in my kids food at every meal. They think they're eating muffins, but they are really devouring a good chunk of their daily nutrition. I came across this muffin recipe when we were in North Carolina via New York en route to Florida in a Dallas newspaper. Take a moment to digest that. I ripped it out and saved it for a time I knew I would be desperate. Well, desperation came knocking on the door this summer. Aside from the usual picky suspects, my daughter's eating habits have gone down the toilet since school let out and my son will eat anything within his grasp, I want to make it count. My daughter calls them pizza muffins. I call them a lifesaver. Preheat oven to 400°F. Coat a 12-cup muffin pan with non-stick cooking spray or use cupcake liners. In a large bowl, whisk together the flour, baking powder, baking soda, pepper, salt, cayenne pepper/chili powder, and flax seeds. In a medium bowl, whisk together the eggs, buttermilk, oil, and butter. Stir in the scallions/chives/onion, ham, cheese, and bell pepper. Add the wet ingredients to the dry and mix until just moistened. Scoop the batter into prepared pan (heaping ¼ cup each for unlined muffin pan or scant ¼ cup each for lined. Bake the muffins for 20 minutes or until the tops are browned. Let the muffins cool in pan for 15 minutes then loosen the edges with a knife (if necessary). Transfer muffins to cooling rack. Serve warm. Wikipedia's definition of Eton Mess is a traditional English dessert consisting of a mixture of strawberries, pieces of meringue, and cream. It is often served at Eton College's annual cricket match against the students of Winchester College. My definition of Eton Mess is a delectable English treat that consists of delicious, fluffy, marshmallowy clouds stacked on sweet, light, feathery snowflakes and intertwined with juicy, red strawberries that desire to be enjoyed with a magical harp playing softly while cherubs with the face of John Krasinski dance half naked around me, throwing rose petals, sunbeams, and sprinkled covered wishes my way. This is seriously good stuff and the perfect dessert on a summer day. Although there is some debate as to whether a banana or strawberry should be used (apparently the creator of this dish used bananas as the fruit of choice), I decided to go with the strawberries and throw in a blueberry sauce. Preheat oven to 200º F. Line a baking sheet with parchment paper. Beat egg whites with mixer until foamy. Add the cream of tartar and continue to beat the whites until they hold soft peaks. Add sugar, a little at a time, and continue to beat until the meringue holds very stiff peaks. Beat in the vanilla extract. Transfer the meringue to a pastry bag. I used a ziploc bag and a star tip to pretty it up a bit, but you don't need a bag or tip at all; you can use 2 spoons. Dollop onto prepared sheets. Leave the meringues in the oven with door cracked to finish drying several hours or overnight. They can be covered and stored at room temperature for several days. Place ingredients over stove and bring to a boil for about 7 minutes. Allow to cool for a few minutes. Be sure to de-stem and take out any wonky blueberries before placing on stove. Start with a few meringues at the bottom of dish you will be using and begin the layering process of meringue, fruit, whipped cream, and blueberry sauce. Serve immediately. My church threw the best BBQs growing up. We were only a small congregation of about 75 people, but the food that would arrive was that of a 1000 people. Aside from all the usual hot dogs, burgers, potato & macaroni salads, the ladies of the church knew how to bake. There was always an array of cakes, cookies, pies, and tarts. A staple dessert at the BBQ (and one of my most favorite summertime desserts to this day) is Strawberry Pretzel Squares. We also knew it as Strawberry Pretzel Salad. When I was 11 years old, the only thing that stood between me and this gorgeous dessert was a scrawny boy named Keith. His mom made it and he KNEW how much I loved it. He was a year older than me and wouldn't let me near it until I kissed him. Boys were so icky until I was about 14, so on a scale of 1 to 10 on the Gross-o-meter, he was a 12. Of course, our Moms thought it was so cute. Gag. I looked him up on facebook a few years ago. I love facebook just for that reason alone. I'm a total lurker. I don't necessarily want to befriend old acquaintances per se, I just like to see how kind Father Time is to people I grew up with. Time served Keith very well. Although I don't know how many women Keith has held ransom to this dessert since, but to be fair, it is a dessert worthy of a kiss. No matter how scrawny the boy is. Note: This is a dessert that requires a few steps until completion. For best results, do not use shortcuts and allow for cooling and chilling times as indicated. Using a blender, chop pretzels into very small pieces. In a bowl, combine pretzels, butter, and 3 tablespoons of sugar. Press into a 9 x13-inch pan and bake for 8 minutes. Set aside and allow to cool. In a mixing bowl, beat cream cheese and sugar. Fold in the whipped topping, and spread over the cooled crust. Refrigerate until well chilled or about 3 hours. Pour gelatin over cream cheese mixture and add fresh strawberries on top, pushing down gently until submerged. I add the strawberries after so they are evenly distributed across the dish. If using frozen strawberries, add them TO the gelatin and then pour over cream cheese mixture. Refrigerate for at least 4 hours or overnight for best results. Black Bean Brownies with Goat Cheese Topping - Gluten-free! Black Bean Brownies with Goat Cheese. Would you believe me if I told you they are unbelievably tasty? If you have a gluten intolerance or allergy, you are gonna. love. me. My husband recently had some testing done for gluten intolerance and the results came back positive. We've suspected he's had one for a long time; it was just a matter of proving it. Of course, for someone that bakes predominately with wheat flour, I realized I needed to find some recipes that are gluten-free so my husband can enjoy a tasty treat every now and again. I went to Whole Foods the other day and noticed a chocolate cake recipe using black beans hanging out in the canned beans section. A co-worker of mine sent me a very similar recipe not too long before that for brownies, but at the time, I put it in the 'Will Try Someday' section of my ever growing recipe folder. When I saw this recipe again, I felt the beans were calling me, either that or I'm losing my mind. Let's say it was the beans. I'm kind of glad they did. 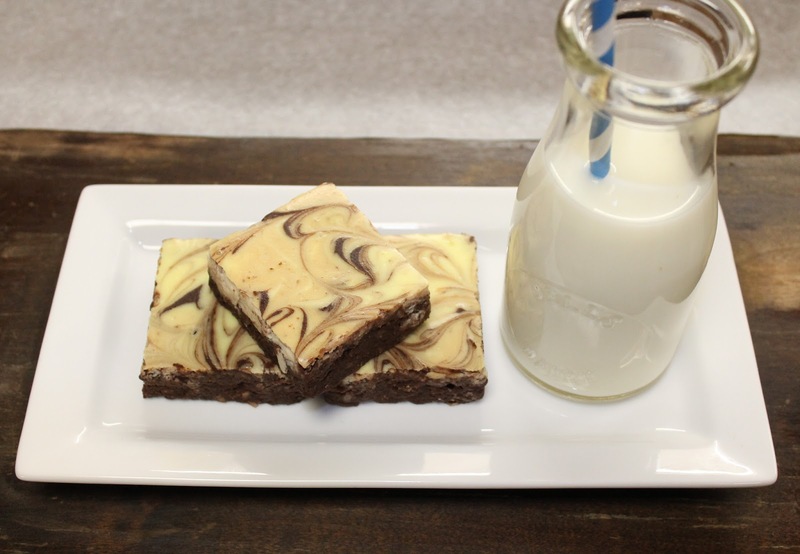 It's a nice change up from traditional brownies, although I will never give those up. But I wouldn't pass on these either. Preheat oven to 350°F. Prepare an 8-inch baking dish with non-stick cooking spray. Set aside. Place the black beans, sugar, eggs, melted butter, cocoa, vanilla and salt in the bowl of a food processor and blend until smooth, scraping down the sides of the bowl to ensure all the beans are completely pureed. If you don't have a food processor because a previous recipe broke it, you can also use a blender. Remove the blade or transfer into a bowl and gently stir in the chocolate chips, coconut, chili powder, and walnuts if using. Transfer brownie mixture to the prepared pan. 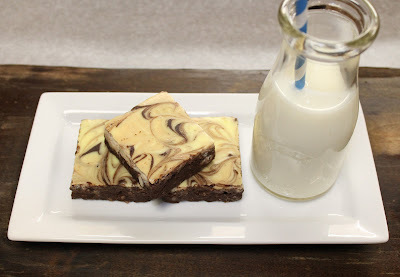 Drop goat cheese mixture onto brownie mixture and swirl using a skewer. Bake the brownies for 28-30 minutes, or until just set in the center. Cool before cutting into squares.